I know that this letter is not going to find you in time, but I have to write it anyway. For my own sake, and in your memory. You see, John, I owe you so very, very much in my life. I know that we have never met, but you have always been such a large part of my life. You wrote The Hobbit fifty years before I was born, but it was so instrumental in me being such a voracious reader. I would have never been so inspired to learn to read on my own if it wasn't for your engaging characters or hypnotic writing. My mother read the first few chapters to me - up until Bilbo and the dwarves were captured by the trolls - and told me that I had to learn how to read myself. That counts as child abuse, no? When I got older and over my fascination with rereading my favorite books, I moved on to The Lord of the Rings. I think it cemented my place in Nerddom and my disgustly obnoxious love of epic fantasy. I wouldn't be here if it wasn't for you. I guess what I'm trying to say is "thank you". Thank you for writing such great books. Thank you for sharing private stories you wrote for your family with the world. Thank you being a part of the Inklings. (I do not thank you for me being inspired to research and read work by Amanda McKittrick Ros.) Just - thank you. You're part of what makes me, me. 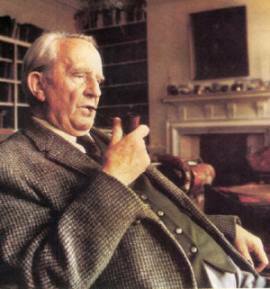 John Ronald Reuel Tolkien (1892-1973) was a major scholar of the English language, specialising in Old and Middle English. Twice Professor of Anglo-Saxon (Old English) at the University of Oxford, he also wrote a number of stories, including most famously The Hobbit (1937) and The Lord of the Rings (1954-1955), which are set in a pre-historic era in an invented version of the world which he called by the Middle English name of Middle-earth. This was peopled by Men (and women), Elves, Dwarves, Trolls, Orcs (or Goblins) and of course Hobbits. He has regularly been condemned by the Eng. Lit. establishment, with honourable exceptions, but loved by literally millions of readers worldwide. I cannot say enough about what he did for the fantasy genre.If there was a mount Rushmore of authors he would be the first one to be voted in. I like your thank letter to him. It is to bad that he did not get to him in time. So are you planning on going to The Hobbit the first movie that set to come out this December?? I'm so in love with all things Tolkien. He's such a visionary writer.